This lovely 1932 Corona typewriter has to be one of the all-time greatest. Click on any key for a closer view! 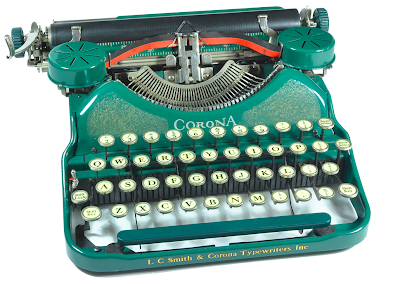 It belongs to UK designer Rob Bowker, keeper of the great Typewriter Heaven blog. He just so happens to have a new post today about the type bar and numerous bar type jokes. Coincidentally, it was just brought to my attention that today, May 16th (still barely that date on this side of the globe), is the anniversary of the patent for the type bar which allowed for a visible display of typing. It is hard to imagine, but when typewriters were first introduced on a commercial scale in the 1870s they featured an under-stroke type bar that obscured any writing by the typist. The Underwood Typewriter Company was the first to adopt the new innovation in 1897 and it became an overnight success. So raise a glass to the type bar today at your neighborhood type bar and celebrate visible typing. Incidentally, Rob tells me he often refers to the typewriter keyboard as the crumb-tray or the coffee filter as the keyboard seems to perform these functions so well. 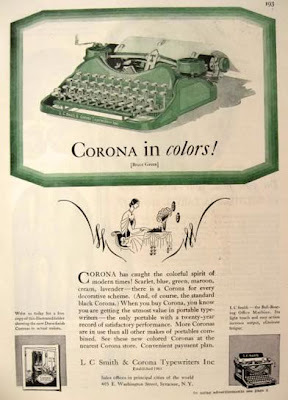 Advertisement for the 1928 Corona typewriter. What a hoot! Whoever said "don't drink and post" had it all wrong!